Aswan was the final destination for our Nile Cruise, and though it is a fairly small city somehow we ended up staying there for four nights (two on the boat and two in a hotel). Historically Aswan has marked the southern border of the Egyptian empire, where the Nile becomes un-navigable by boat due to the large rocks called 'cataracts.' It also marks the starting point for the region known as Nubia (or in the far past the Cushite Kingdom), and a key trade center for middle Africa (Sudan, Ethiopia, etc). It is also quite picturesque, with ubiquitous vistas of the Nile, the cataracts, and the western river bank with ancient tombs and giant sand dunes that mark the start of the desert. 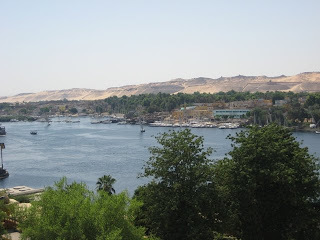 As part of our cruise we completed one day of sightseeing which included the Aswan High Dam, construction of which created Lake Nasser (the world's largest man-made lake) and forced the permanent evacuation of many Nubian cities which now lay underwater. Also underwater of course are countless historical artifacts and temples - but at least one major exception was made through what seems to us to be a most impressive feat of engineering. 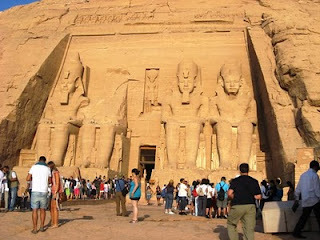 The entire site of the temple of Ramses II was relocated 65m higher and 200m back from its original position in order to preserve the temple, which is the major (and only) attraction in a town called Abu Simbel which is 280 km south of Aswan. The 25 minute flights back and forth to Abu Simbel were sold out, so in order to reach Abu Simbel we had to depart on a bus at 3am - for some reason the buses to Abu Simbel depart as a group convoy at that ungodly hour and return in smaller convoys in the middle of the day, which means that visiting time there gets awful crowded. We hoped the crazily packed temples were not harbingers of our Cairo experience. The remainder of our sightseeing in Abu Simbel was to the tombs of the West Bank - which were cool for the fact that they date from 3000 BC, but not cool for the fact that they appear to be used today as trash cans and restrooms; we also visited the Nubian Museum which had some interesting artifacts and history about the land now mostly underwater. Our hotel had a rooftop swimming pool so it was back to the lazy relaxing and reading time, we also met quite a few folks staying there who were traveling through to Sudan, including an Irish trio driving all the way from France to South Africa. Apparently the only way to Sudan from Egpyt other than flying is on a 24-hour long ferry which departs once a week, and that once coordinated with our stay in Aswan. For meals we braved the local joints and food carts, finding some nice freshly made (and hand-whipped) felafel, shawerma, koshari, the one 'typical' Egpytian dish which seems like a random mixture of various carbohydrates but is actually pretty good. On our last night we took a short felucca ride with Captain "Chillax" Abraham, an appropriate moniker - as there was no wind, the crew didn't have much to do besides smoke, drink tea, and make sure the boat didn't run into anything; we barely sailed more than a few hundred yards up the river before we had to turn around. And we braved the market (called the 'souq') to do a little shopping. Juli did a great job negotiating and entertaining the market salesmen, until I ruined it for her and said that a certain price was a "good price" for the items she was looking for. I did not know she was still expecting to negotiate a lower price. :( On yet another early morning we found ourselves at the airport heading for our final Egpytian stop, Cairo.